SEVERAL beaches remain closed along the southeast coast this afternoon as powerful and dangerous surf kicks in. Surf Life Saving Queensland has reported Boardwalk, Maroochydore and Kawana beaches on the Sunshine Coast and beaches between North Kirra and Southport on the Gold Coast were closed due to dangerous surf conditions. The weather bureau has issued a hazardous surf warning for areas around the Fraser, Sunshine and Gold coasts due to the large swell. An easterly groundswell of around 2.5 metres is being brewed up by Tropical Cyclone Gita and impacting Queensland beaches. Surf Life Saving Queensland has urged beachgoers to "consider staying out of the water and avoid walking near surf-exposed areas". Surfers will look to make the most of a strong easterly groundswell this weekend, with waves of up to three metres expected. Lifeguards have warned that only experienced surfers should enter the water. 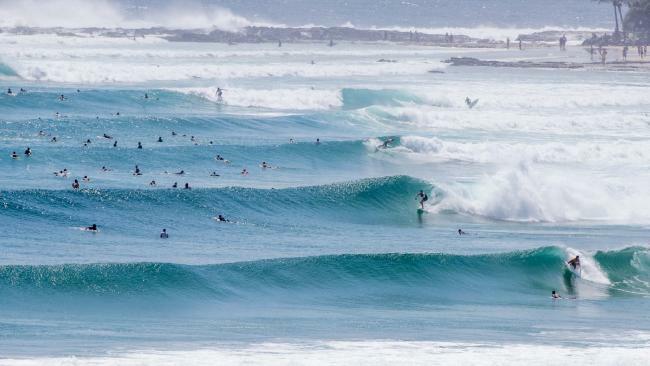 The heavy swell follows a week of wild weather across Queensland. Last night storms rolled across much of the state's south, with more than 200,000 lightning strikes recorded and winds of up to 85km/h sweeping through. Energex said more than 15,000 homes in the southeast were without power last night, with that number reduced to 4000 by 10am today. Footage taken on the Sunshine Coast managed to capture the moment lightning hit powerlines causing what looks like an explosion, while in the South Burnett region one resident filmed the moment winds picked up a trampoline. The bureau said temperatures would remain well above the February average. Brisbane is in for a top of 31C today, while areas in the state's west, such as Thargomindah and Quilpie, will sweat through temperatures of about 43C.